Over the last week the EVE Blogging Community literally exploded with over 200 new EVE blogs! First there was the Podlogs EVE blogging platform which launch on May 11th. With some great looking themes for all your capsuleers' content, it currently lists almost 50 EVE blogs. Then came GameScribe, launched earlier this week as part of contest with some great EVE Online loot. The results of weeks of work and preparation by @AnMiTh, the genious behind Titan Weekly and the EVE Network News, the site now bosts more than 170 blogs! Suffice to say, I'm hard at work trying to add all those blogs to my EVE Blogroll! Before the explosions of new blogs happened, a few new EVE blogs had gained my attention. These are listed below. Articulated Sky, CSM 2009: What’s in it for you? Oh by the way, readers familiar with the EVE Speedlinking series will have noticed that I've once again moved the day of the week when I post the lists of links. Life being what it is, it's much easier for me to post these posts over the week-end then it is during the week. Thus the new schedule. Hope you don't mind! I'm was usually pretty quick to post the EON table of content when I got my issues in the past. Unfortunately I was still very much taken away by Real Life's responsibilities when I got the 15th issue of our beloved magazine. Once I got it though, I was quickly caught-up in the richness of this latest issue. It's got some great articles ranging from Finnigan's Quaterly Alliance Report, to the Clear Skies II interview, to the brilliant and no less scary "The End?" essay on the possible Big Crunch of New Eden. And lets not forget the chronicles, the "Beginner Ships" article, and much more. All in all, an issue that everyone who's put an effort into, should be proud of! When anyone in the press cries wolf saying that Print media is on the verge of implosion, I look at my issues of EON and shake my head. Good work Zapatero! Great results guys! 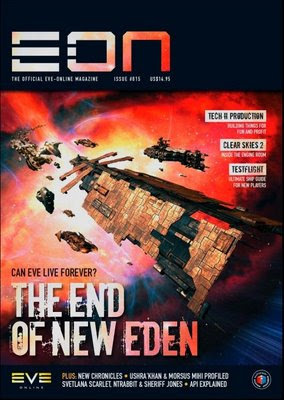 40 ---- Cover Feature: The End?